Our Abpromise guarantee covers the use of ab150105 in the following tested applications. 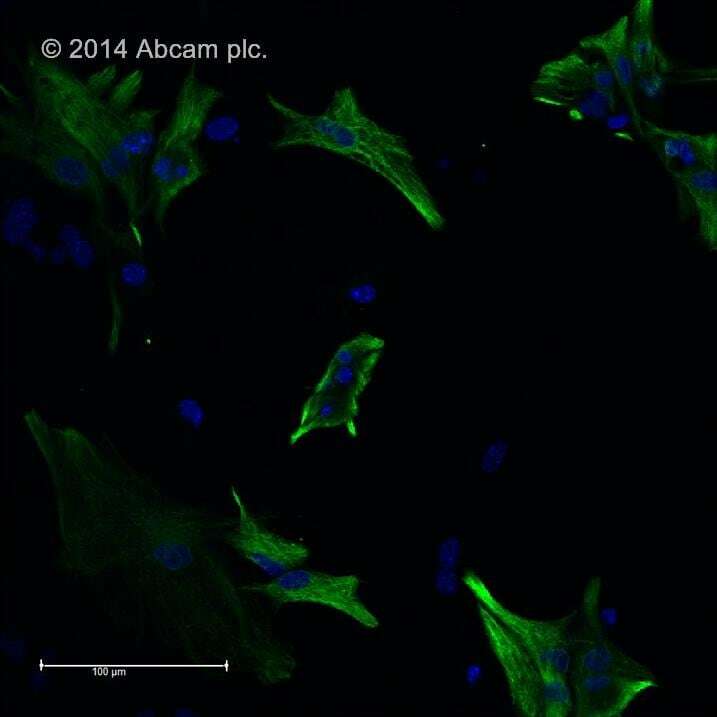 ICC/IF image of ab7291 stained HeLa cells. 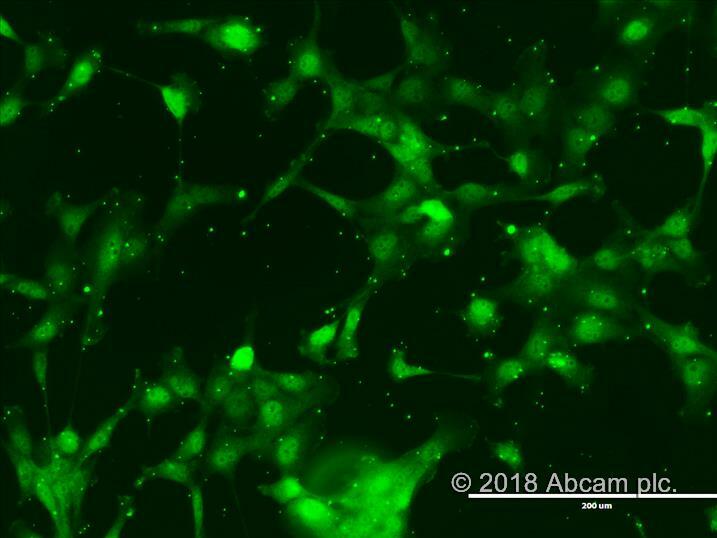 The cells were 100% methanol fixed (5 min), permeabilized with 0.1% Triton X-100 for 5 minutes and then incubated in 1%BSA / 10% normal donkey serum / 0.3M glycine in 0.1% PBS-Tween for 1h to block non-specific protein-protein interactions. The cells were then incubated with the antibody (ab7291, 5µg/ml) overnight at +4°C. 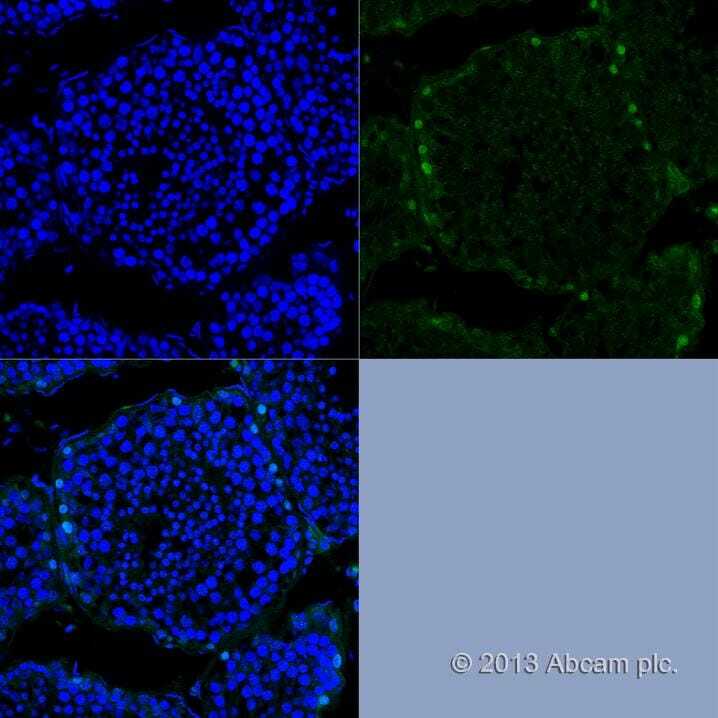 The secondary antibody (green) was ab150105 Alexa Fluor® 488 donkey anti-mouse IgG (H+L) used at 2µg/ml for 1h. DAPI was used to stain the cell nuclei (blue) at a concentration of 1.43µM. Publishing research using ab150105? Please let us know so that we can cite the reference in this datasheet. Result: Specific staining with low background. Excellent antibody. Used at 1:500 dilution in PBS-Triton X-100 (0.1%) overnight at 4 degrees. 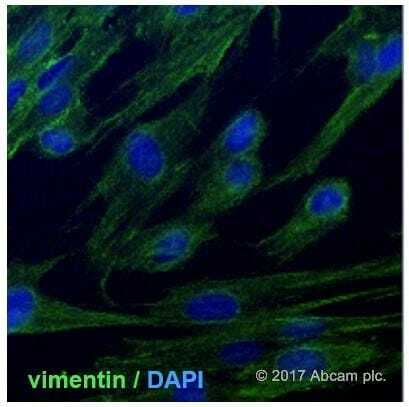 Used in conjunction with GFAP antibody (Ab80842). Stable fluorescence when mounted with Vectashield (inc DAPI). SALL4 staining in adult marmoset testis. This antibody works perfectly at a 1:500 dilution with SALL4 primary antibody (ab57577, mouse monoclonal). However, the intensity of this Donkey secondary antibody is weaker than that of the Goat secondary antibody (ab150113) at the same dilution. So that is why I gave it 4 stars.